This recipe was in the lineup for the winning team at the 2017 EGGtoberfest held this past October. I am proud to be a member of the team that won the people’s choice award: Team EGGcellent Eats. The team features an all-star lineup of some of the best Big Green Egg chefs on social media. This is my recipe that was featured during the event and helped the team take home top honors at the festival. Now sit back, grab an ice cold Reformation Cadence Belgian Style Ale, and enjoy this recipe for Crispy Asian Glazed Pork Belly. Start with a nice slab of pork belly (I found this one at Costco). Remove the skin and cut the pork belly into cubes. Cover with a little yellow mustard (for a base), salt, pepper, and place on a wire cooling rack. Set up your Big Green Egg for indirect cooking at 275°. Use your favorite wood to add some smoke flavor to the pork belly. Place the wire rack (with the pork belly) on the cooking grid of your Big Green Egg. Cook the pork belly for 3 hours or until the internal temp measures 190°. Spray the pork belly with apple juice every hour until done. For the Asian glaze use Gochujang, white pepper, Mirin, Hoison, Rice Vinegar, Honey, Ketchup, Garlic, and Ginger. Once the pork belly is up to temp, pull them off the wire rack and place inside of an aluminum pan. Pour the Asian Glaze all over the pork belly and cover the pan with a piece of foil. Place the pan back inside the Big Green Egg for another hour to an hour and a half. Once the Asian glaze has reduced and the pork belly is tender, serve and smile! You will want to put the glaze on everything. This recipe for Crispy Asian Glazed Pork Belly has the perfect balance between heat and sweet. 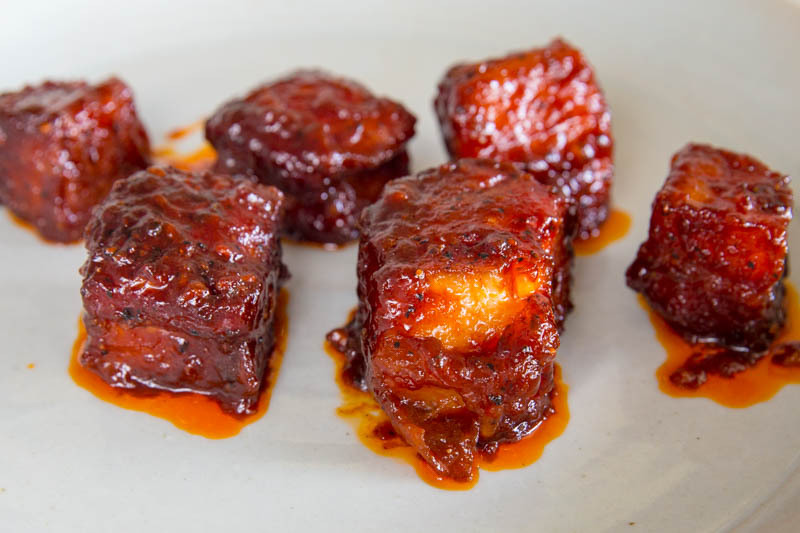 If you want to make something different using your pork belly try this recipe! Keep up the great work, my friend – you’re my secret weapon. This looks delish. I’m going to try it out tomorrow. Did you use any wood when cooking for smoke flavor? Yes Renee… I used a chunk or two of apple wood for this. 2Thumbs UP!! I left the skin on. Any Advice to make the Skin Crunchy?? Thanks! I love this recipe. I always cook this with the skin off. However, if you leave it on sear it at the end to get the crispy skin like you would a duck breast.